The music group Audioslave, who happens to be the Xbox Artist of the Month of August, has a new album coming out called Revelations. The artwork for the new album has a photoshopped satellite photo of the Earth from space with a new continent on the surface in the shape of part of their logo. 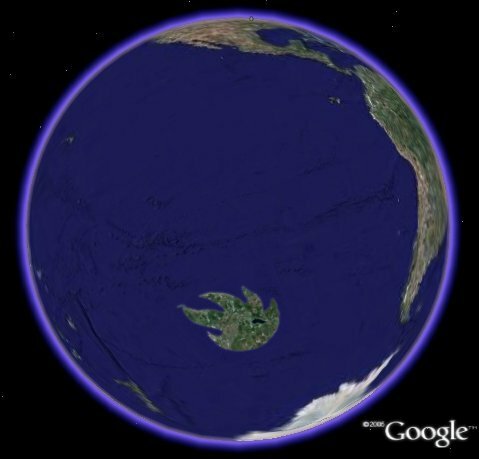 They also have released a Google Earth file which shows their new "nation" overlayed in the middle of the Pacific Ocean by patching together GE satellite photos. They call it AudioSlaveNation. I guess the promotors of "Superman Returns" missed this trick.... Lex Luthor's masterplan would have been perfect fodder for something like this. After a year Google Earth was released and considering the appealing and multipurpose capabilities of this 3Dglobe/web browser? I wonder why the examples of using GE as a marketing tool are so few. To produce KML code is economic compared to standard marketing strategies and the advertising campaign reaches public all over the world. Thus, I can?t understand this slow reaction. "The utopian island of AUDIOSLAVE NATION is located in the Indian Ocean between South America and New Zealand at approximately at 42° longitude and -137° latitude."